Despite increased attention on concussions, parents and coaches don’t always know when to seek emergency medical attention for kids or when it’s safe for an injured player to return to playing sports, according to a KidsHealth survey of 500 parents and coaches. 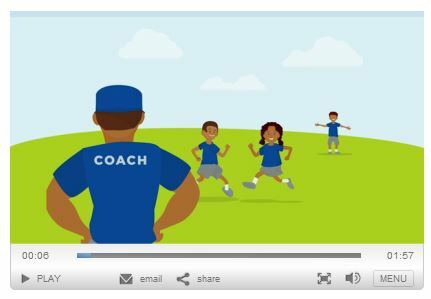 Based on these survey findings, KidsHealth created a new animated video to clarify often misunderstood information (and dispel common myths) about concussions. In addition to including the video within your article, Concussions: What Parents and Coaches Say, we can also provide the main video file for you to post to your social media outlets. 56% of coaches said that they would follow the proper return to play rule, while 51% of non-coaches would do something other than the proper rule. 67% of parents allow their kids to still play in organized sports, but are more cautious in the wake of the media’s focus on concussions. Share your KidsHealth Special Needs Factsheets with teachers, school nurses, parents, and families within the communities that you serve. These factsheets explain the basics about concussions and how they and other brain injuries can affect learning in the classroom.